fisherman’s creed-God does not detract from one’s life those hours spent fishing. 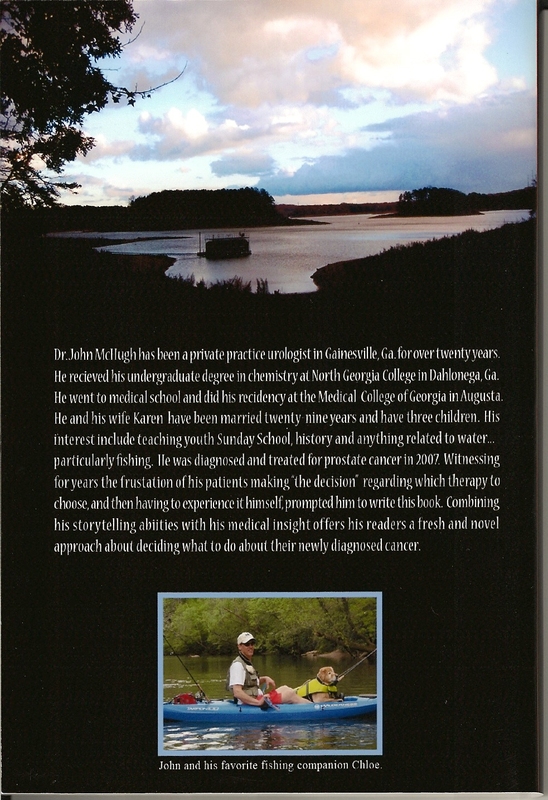 Dr. John McHugh has been a private practice urologist in Gainesville, Georgia and on the staff at the Northeast Georgia Medical Center, for over twenty years. He received his undergraduate degree in Chemistry at North Georgia College in Dahlonega, Georgia. He went to medical school and did his urologic residency at the Medical College of Georgia in Augusta, Georgia. He and his wife Karen have been married thirty years and have three children. 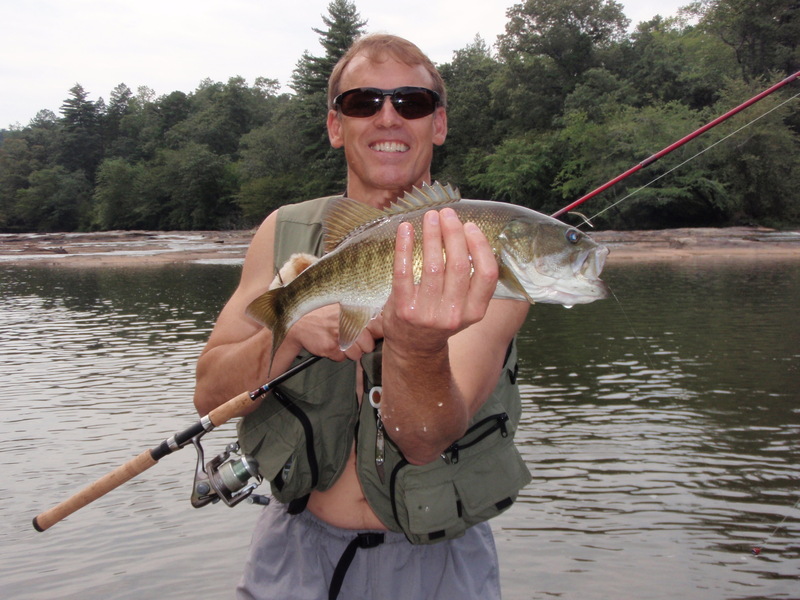 His interests include teaching youth Sunday school, history, and anything related to water, particularly fishing. He was diagnosed and treated for prostate cancer in 2007. Witnessing for years the frustration of his patients making “the decision” regarding which therapy to choose and then having to experience it himself, prompted him to define his “decision making” journey for others. In the months that followed the results of his biopsy, it became clear that the decision is multifaceted and depends a lot on the patient’s particular situation at the time of diagnosis. Combining his story telling abilities with his medical insight and experience offers the reader a fresh and novel approach to deciding what to do about his newly diagnosed cancer. PS. This picture was taken during a photo shoot for the cover of my book. The photographer was troubled both by what should be used to fill up the urine bag as well as how to get the fluid into the tubing. He used apple juice, too orangy, and to get the juice into the tubing he had to over fill the bag. The result seen here is apple juice in bag, enlarged and in front. Wrong color and a way too big bag. (Am I to lug that around all day seeing patients?) So to get the color of the “urine” and the size of the bag to look right, I poured beer in a urine bag one morning at 7A.M. before surgery and Travis took a picture of that and superimposed the “corrected urine bag” on to the final cover for the book. Several medical-types that saw the initial picture, seen above, and immediately quipped, “Bags don’t get that full Dr. McHugh and urine ain’t that color. You need to fix that.” Beer and Travis Massey’s manipulations did the trick as seen on the Icehouse post. The back cover is important to me in several respects. The top picture is of Lake Lanier in the midst of a drought in Northeast Georgia circa 2008. It was a rainy and cold day. The retracted lake accentuated the “big sky” look of the shot. The dock you see is one that was built for the Jessie Jewell family probably sometime in the 1960’s by Martin Boat Dock Company. It is a quonset hut type design that they popularized for this area and is now illegal to have unless it is “grandfathered in.” I have a picture of Jessie Jewell in the dock on his boat that was used for a dock show by the Martin Boat Dock Company in New York at that time. The cabin and property mentioned in “The Decision” is here. Jessie Jewell brought the chicken industry to Northeast Georgia. Our area is now the largest producers of processed chicken in the world and he was the man that started it all. The shower glass in the cabin has the letters, “J.J.” etched on them and it is something I cherish. I have a book about him in my exam rooms, his father committed suicide and was discovered by his brother. I have chairs in the cabin from his estate sale. As a patient that worked for him told me one time, ” Back in his day, I am telling you, he was blowing!” Jewell ultimately had to sell his business when the price of chicken went down and he closed the business. Another patient telling me about his driving around the country to pick up Jewell Chicken started to cry. There are cement bleachers facing the lake in front of the dock you see in the picture. He built these in the 50’s so the employee’s of his company could have a place to sit and eat at the annual Jewell July 4th company party. So now you know. The front cover, the dual nature of the urologist with a catheter and at the same time telling someone he has prostate cancer, the lake with the Jewell dock and location that I told my wife that I had had a prostate biopsy, and then the river and the memory of its saving grace to me and the comfort it gave my brother during a difficult time. Now you know the “rest of the story” about all the pictures on the book. The window at the top left side of the house is partially opened or “cracked.” My mother smoked when she watched T.V. and blew the smoke out the window that was near the chair. She liked chocolate as well and would put the wrappers under that chair and then denied that she ate the chocolate or put the wrappers there. “I keep it cracked to listen for sirens and worry about my boys.” The house was a two bedroom, one bath house built in the 30’s. 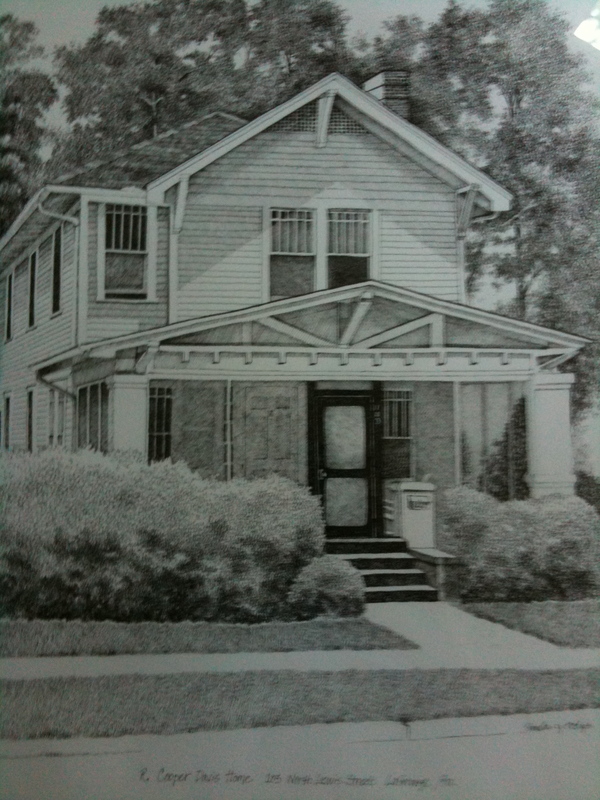 My grandmother, (her husband Robert Cooper Davis passed away in 1959), my mother and five boys all lived in that house. My grandfather was everything to me. He died, I think in 1959, I really did not know him. But… he was everything. 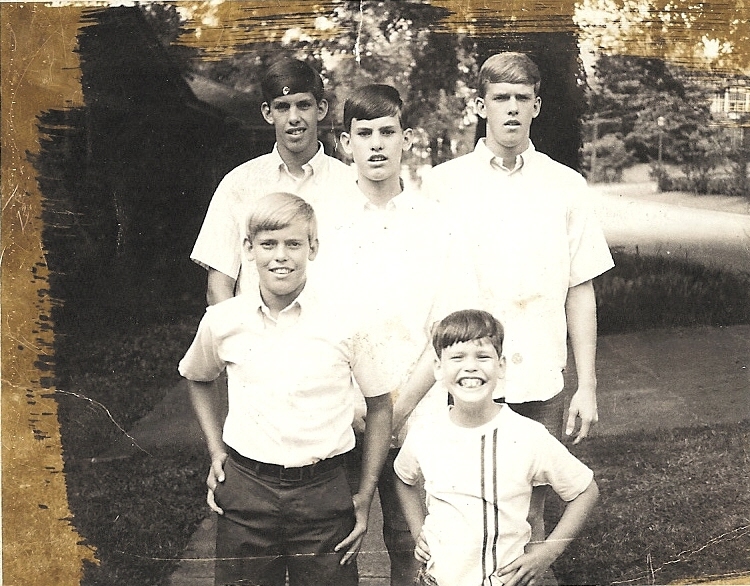 In the picture above you can see the resemblance to two of my brothers, particularly Bob (the boy in the middle). He was truely a man about town in LaGrange, Ga. He served in War World One in the Navy. He was a stud at North Ga College in 1907 in Dahlonega, Ga. How do I know this? Well. When I was a student at NGC on many occasions I would go into the library, ask for the librarian to open the locked historical showcase and get the 1907 North Georgia College yearbook. In that yearbook that I requested probably thirty times while I was at NGC, was a reference to my grandfather, Robert Cooper Davis. He was one of the reasons I went to North Georgia College. Since I grew up with my grandmother, I was told stories about the times he was there. Two quotes come to mind that were attributed to my grandfather. One was my grandmother telling me that be prepared for the cold. In the clip below, when I mention history and reasons for attending NGC, my grandfather, despite me not remembering him-he died when I was around four, is one of the big reasons for me ending up in Dahlonega. 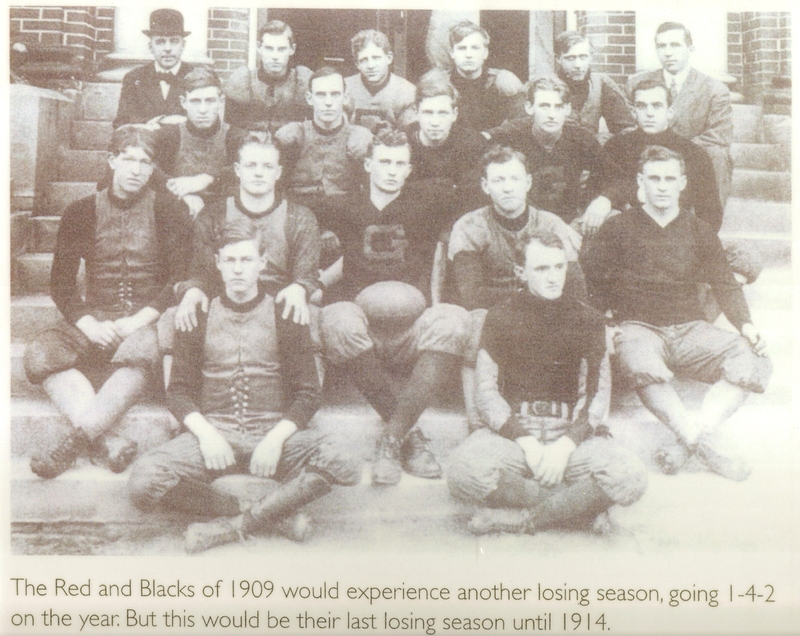 From the 1907 North Georgia College Yearbook: ” Robert Cooper Davis, or as we referred to him as Lope Davis, the best football player of 1907 and the best dancer of the freshmen class of 1907.” He then received a football scholar ship to the University of Georgia and got a degree in Pharmacy. 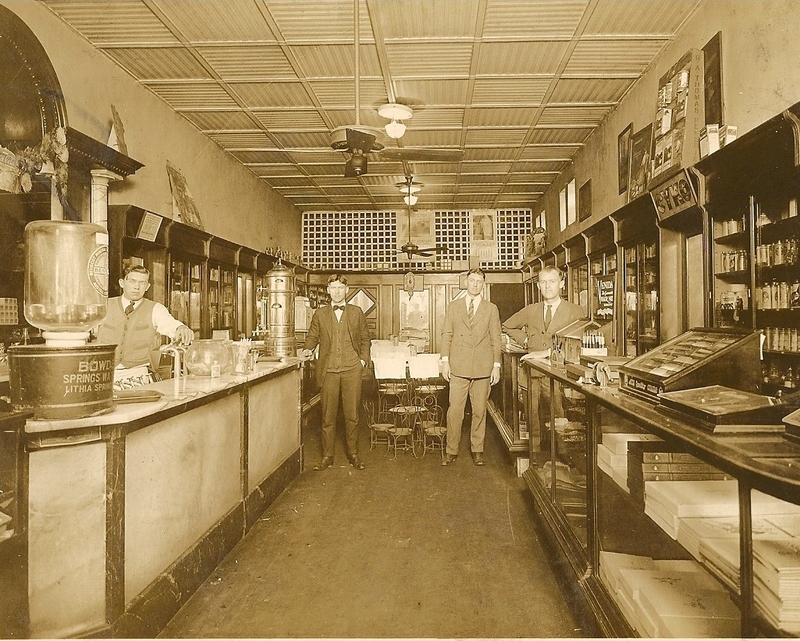 Davis Pharmacy Circa 1930 On the Square LaGrange, Ga. Cooper Davis is second from right. My grandmother would kill a chicken each morning and make chicken salad sandwiches for the pharmacy and they sold for a nickle a piece. 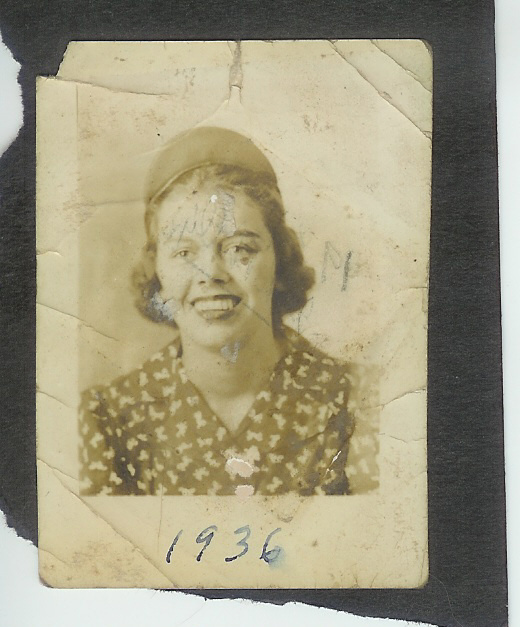 After high school my mother, Jennie Cooper went to Hunington College for girls in Montgomery, Alabama. She quit after her sophomore year to join the United States Coast Guard at the start of World War II much to the dismay and chagrin of her parents. Her sister Betsy attended Auburn much to the chargin of Robert Cooper a UGA alumni and football player. I am always honored when people give personal stories and insights of their battle with cancer. My mom lost her battle with breast cancer and both my dad and brother have BPH, which lead me to want to provide information and natural products on men’s health. I signed up to be notified when you add new posts. Your book is of great help in understanding prostate cancer and in making a decision as to treatment. Why do you not cover Proton Therapy? I know that most urologists don’t even discuss it and my experience is that they don’t know a lot about it. 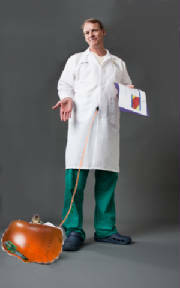 But in a book that covers the options of treatments I cannot understand why it was not included in your book. My research shows that proton therapy is very effective with few if any side effects. I personally plan to have this treatment. I am interested in your feedback. You are right, I don’t think most urologists understand the pros and cons of proton therapy, I certainly don’t. I had an extended discussion with a physicist and a radiation therapist this past Friday. Their contention is that patients are the ones (particularly the ones that opt for proton therapy without taking into account the specifics of “their” disease) who don’t understand the difference between a photon and a proton and its clinical usefulness. For instance, they told me that if there is a concern of capsular penetration by the cancer (higher Gleason, higher PSA, and the positive cores are lateral) then photon therapy is better than proton. Now, as to why I don’t discuss proton therapy in the book is that I , rightfully or wrongly, considered proton a form of radiation therapy and that if a patient chose that option then the radiation therapist would discuss the pros and cons of each. A point you have not made but is relevant is that will a radiation therapist or hospital that doesn’t have the proton machine be biased against recommending it. For a patient to be a candidate in most cases he would have to be willing to travel and possibly pay more. (See the link on this post.) So…in your case (although I am sure you have vetted this) the specifics of your cancer may be better suited to the photon and not the proton. If you’d like, if you’ll give your stats I’ll ask our guy here and see what his thoughts are. We might all learn from this. Thanks so much for your input and I sincerely wish you well. JM Ps…put you stats up against the Partin Table and determine the likelihood of capsular extension. If the percentage is on the high side i.e. 20%, you may be better served with EBRT. I of course defer to you radiation therapist. I have not bought your book yet, and hopefully will not have to ;). Your website is very informative. As an owner of an 18 month chocolate lab, I found your pictures comforting as I read. 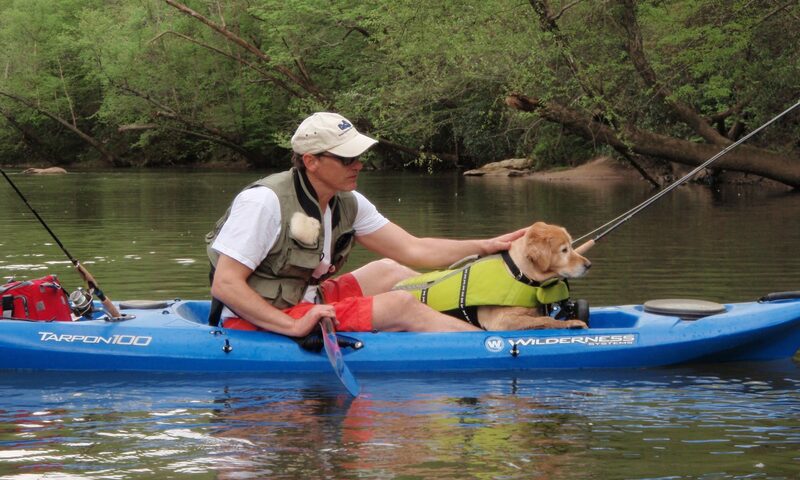 Few things beat the joy a loving companion brings. Oh yes, I should not forget to mention you provided a lot of good information to think about. My biopsy is in 2 weeks. Age 44 psa 2007.2,4 2008,2.7 2010,4.7…:( Based on what I read, my psa velocity does not bode well. You mention 17% of biopsies return positive cancer results. Odds are in my favour then. I don’t know what the timeframes are like in your area, but I have been waiting since mid October for a referral to the urologist who in turn scheduled the biopsy. Far too much time to think about what ifs. I of course have been searching for information, but most seems to rehash the same things. One item that is not discussed is ADT for local non-advanced cancer. Why is intermittent ADT not considered while doing active surveillance? I know it is not a cure, but with mostly reversible side effects and effective reduction in tumor size, would it not give a longer opportunity to consider the appropriate treatment path while reducing the chance of escaping the prostate? I have found several references that ADT is not considered before surgery. Is there a reason for that? Your site is very informative and interesting. I am glad to have found it. My name is Marie Monbureau. I am a PhD in behavioral biology and I am currently doing some research for BlueshiftResearch in San Francisco. This is a firm that studies trends in a number of different sectors. I am currently working on a project investigating the recently approved prostate cancer treatment, Provenge. I am looking to speak with experts to get their opinion on the potential of this treatment (efficacy, adoption by patients and doctors…). I was wondering if you would be willing to take just a few minutes to speak with me and to answer a few questions either by phone or by e-mail. If so, please send me a number and a good time to contact you. I really appreciate your help and I look forward to hearing from you. I read your book thoroughly and eventually had robotic surgery 10 days ago. I had a good path report and was ecstatic when the catheter came out after 1 week. Boom, the next day I gradually stopped voiding completely. The catheter was replaced (ouch), and my bladder irrigated. I was told the urethral anastomosis was still inflamed and that I needed the catheter another week or so. I was also given Flowmax and Macrodantoin. So, instead of having the incontinence I dreaded, I ended up overcontinent; what irony. Can you comment on this situation and your experience with it, if any? Thanks for this solid, dependable blog. I bought an electronic version of your book and enjoyed it immensely. I’m 42 years old and am scheduled for a robotic prostatectomy on December 16. While I had already made my decision, reading your book and going through the decision exercise was helpful in reaffirming my decision. I’ve also enjoyed your blog, and the information available through your iPhone app. Good luck with your continued recovery. I just happened across your blog. My father, John McHugh, M.D. 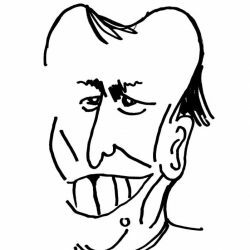 (a different John McHugh from this blog), from Shelby, Ohio died of cancer a couple of years ago. He was one of those rare cases where they never did find the source of the cancer. He provided health care to many in his small town for generations. It’s good to see another McHugh keeping up the good work!